So, are you curious what ITEMS can you use in our game Journey Online? 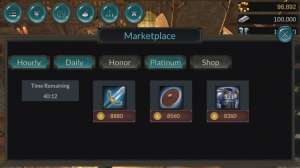 In Journey Online items represent the core of building your adventurers. 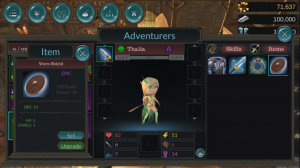 Adventurers themself start with some basic stats from level 1 and increasing their levels does not change their stats. With a full set of items you can build your adventurers any way you want. Do you want to make the tanks tankier? Or do you want to make a sneaky move with having a tank unit up front but instead adding a bunch of attack on it and surprise your enemies in arena? While the Main Hand and the Off Hand equips tend to increase your attacking stat and your defensive stats, the support items can vary and increase any stat that it holds. Each item has a Main stats and Sub stats. In the example, the shield has a main stat DEF of 13 and it has two sub stats HP 5 and ENREG 1. When an equipable item is dropped as loot or purchased from a store the item randomly obtains its rarity and depending on its rarity the rolled stats on it. Also note that if an item can roll its stat from a certain min to a max, the roll can be higher if the rarity is rarer. Example: A worn shiled that Common rarity could roll its DEF stat from 5 to 10 at +0. While an Epic worn shield in our example rolled its DEF to 13 on obtaining. Every item starts of with a main stat which can be increased by powering it up. You can repeat this process until the item is powered up ten times and reaches +10. 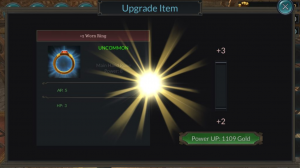 Each time an item is powered up its main stat is increased by a tenth of its possible roll and increased by the rarity modifier. This way the item is not only better originally if its higher rarity, but also during its power ups.